The Best Cream and Liquid Highlights! Clinique Chubby Stick Sculpting Highlight, $22. Benefit Cosmetics Girl Meets Pearl, $30. Benefit Cosmetics Watt’s Up! Cream-to-Powder Highlighter, $30. Becca Shimmering Skin Perfector, in the shade Opal, $19. As you know, it is super on trend to have glowing, dewy skin this Summer! I love powder highlighters, but I can achieve an intense glow effect when I use liquids! I have a few different purposes for these products and wanted to share how I use them to achieve a flawless, lit-from-within complexion! First up is the Clinique Chubby Stick Sculpting Highlight! This cream-to-powder formula is applied best with your fingers or a damp beauty blender depending on your desired intensity. I would describe the color as a shimmery, pink-toned, silver highlight. It gives a subtle effect to light skin tones because it’s such a fine shimmer. If you have a medium to tan skin tone, then it will be a bit more noticeable since it doesn’t have warm undertones! The only con to this product would be its ability to fade throughout the day. That is why I like this product to layer with my powder highlights to give them an extra boost and prolong the longevity of both products. My favorite powder highlight to wear with this cream highlight is the “Mary Lou Manizer” by TheBalm. I find that using a powder highlight with a champagne shimmer counteracts the sometimes unflattering cool tones of the Clinque highlight formula! 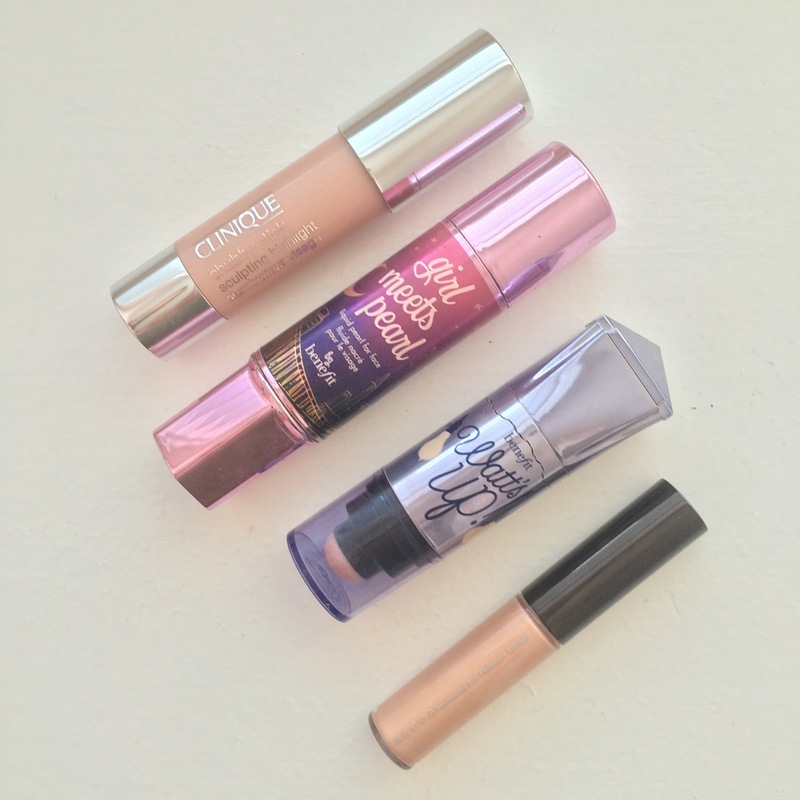 My next favorite is the Benefit Cosmetics Girl Meets Pearl liquid highlighter! I love this product to mix in with my liquid foundation to give my skin a natural glow effect. I find this product is perfect to add into any foundation because it won’t change the color. Some liquid highlights can turn your foundation more yellow or more pink, the Girl Meets Pearl gives a natural, subtle champagne glow that is universally flattering. I only use this product to mix in because it does not look good when I try to use it like a cream highlight. Whenever I place it on top of my cheeks and down the bridge of my nose, it causes the foundation to break up and look patchy. Of course, Benefit packaging is so cute, which is another reason to check this product out! The twist up container it comes in makes sure your product stays as hygienic as possible and ensures no leaking if you do want to travel with this product! 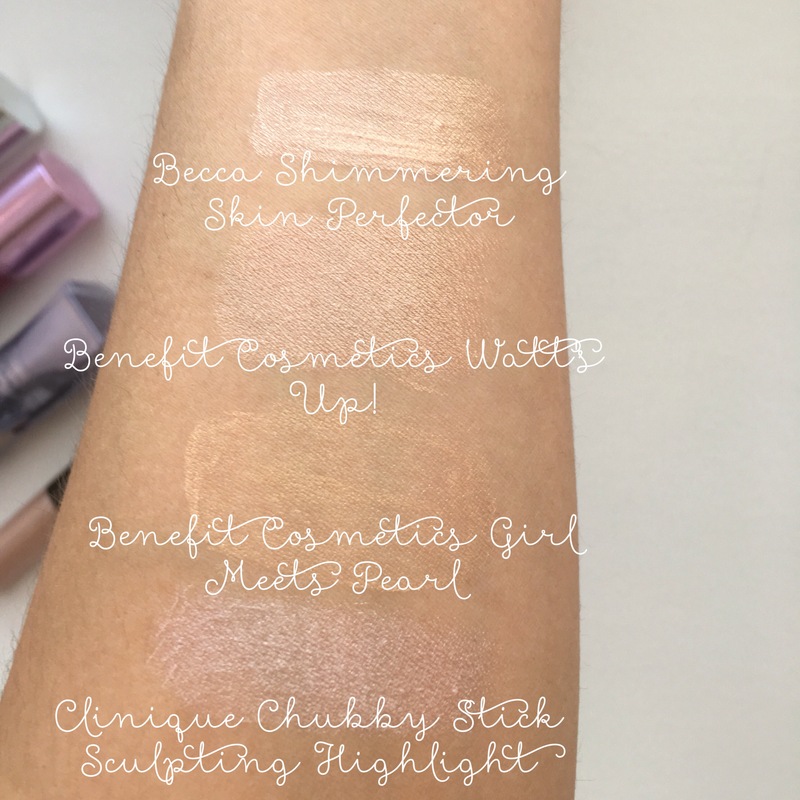 My absolute favorite cream highlight is Benefit Cosmetics Watt’s Up! It has a perfect golden shimmer that gives your skin that intense, almost wet looking effect! This product makes me feel like I’m actually J-Lo (which is the best feeling ever) and it will last all day long! Since it’s a cream-to-powder formula, it will not break up when placed on top of your foundation. It also looks beautiful when layered with a powder highlight on top! I love using Champagne Pop by Becca to layer on top of this because the warm-peach undertones compliment the Watt’s Up golden tone in such a gorgeous way! The Becca Shimmering Skin Perfector, in the shade Opal is a gorgeous product to blend on your bare skin, before foundation, so that it peaks through when the light hits your face! This is a very pigmented, intense glow so I use this product very sparingly. I have tried to use this product over top of foundation and find that it only works if used with a damp beauty blender because it will break up your foundation if patted in with your fingers. I love the subtle champagne shimmer this product gives and it is highly reflective, which makes it so unique in my collection. I love to layer Becca’s Shimmering Skin Perfector Pressed on top of the liquid version because it just intensifies it even further and will ensure your highlight lasts all night long, even through the Summer heat! Liquid and cream highlights can be intimidating because they do require a lot of blending to look good, however I do find that they give a unique, intense glow effect that cannot be replicated with powders! I want to share my favorite powder highlights soon because I have quite the collection, so let me know if you would like to see that! Thank you so much for reading!